On February 13, Pakistan Post issued a multicoloured 15 Paisa stamp to mark the armed Forces Day. 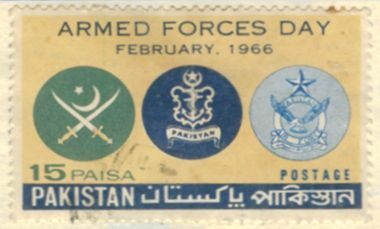 The stamp with yellow background had emblems of all three branches of the armed Forces of the country. On the eve of the inauguration of the first atomic reactor of the country, under the auspices of PINSTECH (Pakistan Institute of Science and Technology), located at Nilore near Islamabad. The institute was to become a hallmark in the history fo Pakistan which later paved way for further development and research on atomic power in the country. 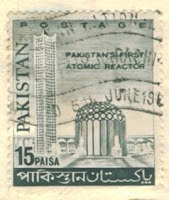 The 15 Paisa stamp showed the elevation of the PINSTECH building was issued on April 30, 1966. Habib Bank Limited was the only bank in the private sector on the eve of creation of Pakistan. 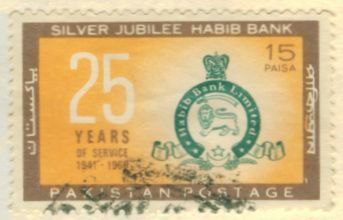 On august 25, a multicoloured stamp showing the emblem of the bank was issued on the eve of its 25th year of operation. A red and yellow coloured stamp (above ) of 15 Paisa face value was issued on October 3, 1966 to commemorate the International Children Day. 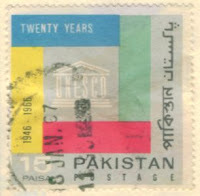 On the eve of the 20th anniversary of UNESCO, a 15 Paisa stamp was issued (below) on November 24. The stamp displayed the emblem of UNESCO. President Muhammad Ayub Khan had a dream of building a capital city for Pakistan. The work on the project started under the foothills of Margalla Hills near Rawalpindi in 1960 and the capital was formally inaugurated in 1966. 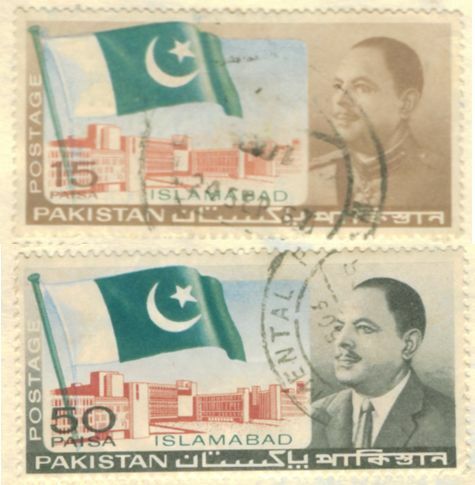 On November 29, Pakistan Post issued a set of two stamps priced at 15 and 50 Paisa respectively as shown above on the formal inauguration of the new capital. The stamps displayed the Pakistani flag, the federal secretariat building and photos of president Ayub Khan both in uniform and in suit. The capital Development Autrity (CDA) is celebrating the 50 years or the Golden Jubilee of the day this year. On the foundation of the Health and Tibbi Research Institute, a 15 Paisa dull green and salmon coloured stamp was issued on December 3. The stamp displayed the portrait of famous Muslim scholar and researcher Avicenna or Abū ʿAlī al-Ḥusayn ibn ʿAbd Allāh ibn Sīnā. Ibn-e-Sina, as he is commonly known has great contribution in the field of medicine. 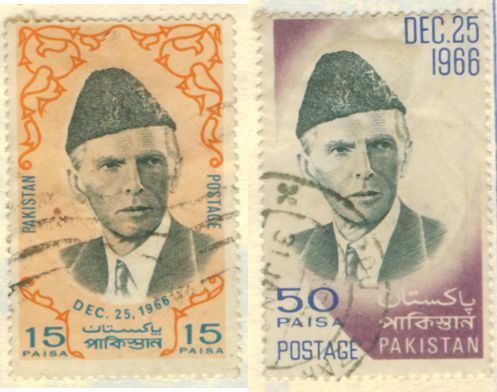 The last set of two stamps of 1966 was issued on December 25 to commemorate the 90th birth anniversary of Muhammad Ali Jinnah, commonly known as the Quaid-e-Azam, the founder of Pakistan. The two stamps valued at 15 and 50 Paisa showed the portrait of the father of nation wearing the famous Jinnah Cap or the Karakul Cap, which became the national headdress of Pakistan.